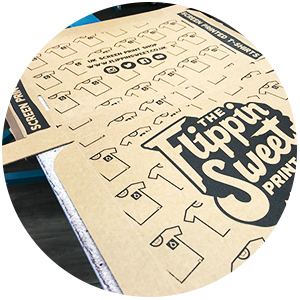 Screen Printed Garment Boxes | The Flippin Sweet Print Co.
We can provide flat stock card t-shirt/garment boxes with a screen printed finish. The boxes come in range of colours including white or kraft. 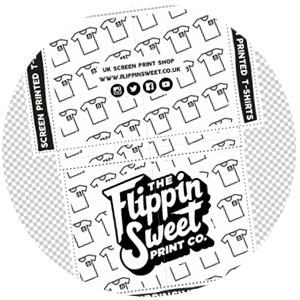 We supply the printed boxes flatpack but if you require your t-shirts folded and packaged we can do so for our standard packaging fee + extra postage. 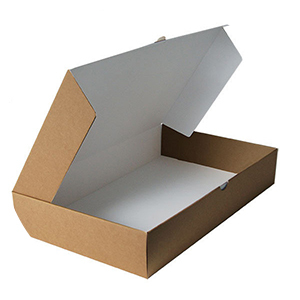 We can provide boxes in a variation of sizes to suit. Our basic option perfectly fits within the Royal Mail “Large letter” size. This is great if you sell online as you can keep your postage costs to a minimum. We also have a premium range that we have developed and custom manufactured to perfectly fit either a t-shirt or a hoodie. The flatstock boxes can be screen printed inside or out. Printed boxes are a creative way to market your brand at the same time protecting your garments and cutting postage costs. We have a range of offers available for single colour printing providing excellent value on the order form below. If you’re looking for multiple colours or quantities outside of the offers, get in touch. It is recommended in quantities of 500+ for best value. The boxes are printed using eco friendly waterbased odor free ink. 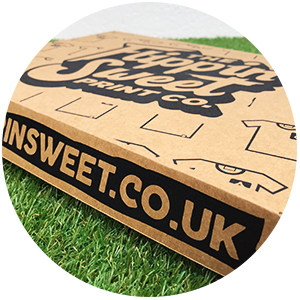 Our basic t-shirt boxes are the ideal solution if you are looking for plain or screen printed garment boxes sized to perfectly fit within the Royal Mail Large Letter standard, reducing your postage costs. The basic boxes come in kraft or white and can be screen printed. 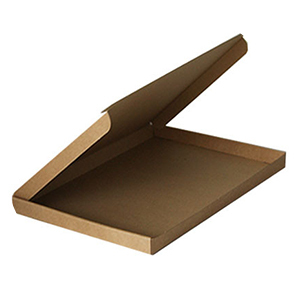 We have our premium t-shirt boxes custom made and are sized to comfortably fit a folded t-shirt of any size. The boxes can be made in a kraft, white or a colour can be overprinted. The premium boxes are great plain or we can screen print your custom branding. We have our premium hoodie boxes custom made and are sized to comfortably fit a folded hoodie of any size. The boxes can be made in kraft, white or a colour can be overprinted. The premium boxes are great plain or we can screen print your custom branding. You can design your custom screen printed boxes using our easy to use templates. You can import the template in to a vector artwork package such as Corel Draw or Illustrator and the template includes guidelines for bleed and artwork placement. Artwork should be provided as a vector file format to ensure maximum print quality. Choose between our basic (large letter size) t-shirt box or our premium range and the quantity you need. Please choose your print placement. Choose either on the outside, inside or both. Please upload your artwork in a vector format (ai, pdf, cdr, eps) or a high resolution jpg. Please choose your prefered payment method. If you choose PayPal when you click "submit payment" you will be transferred to secure checkout by paypal.